This rhinestone and Swarovski crystal headband is a three-strand piece that simply explodes with loads of brilliant, sparkling rhinestones and an array of delicately placed faux pearls. 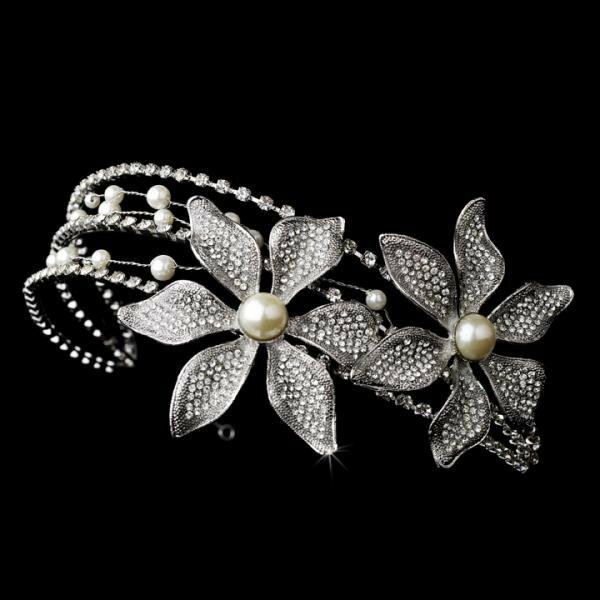 Prominently placed on one side of the headband are two large silver-plated flowers, a creamy ivory pearl adorning each one’s centre bloom. A compliment to any white, off-white or ivory wedding dress, this piece is sure to impress. The headband measures 35.5 cm in length; detailing measures 30 cm in length and up to 7.6 cm wide. Pin loops allow you to fasten the piece securely in your hair with bobby pins.